Other than the Super Bowl®, February is probably most noted for Valentine’s Day. Roses and chocolate will abound as couples affirm their undying love for one another. In the Garden of Eden, when God originated marriage, He referred to a man and a woman becoming “one flesh.” In that term, God obviously envisioned an ultimate closeness, devoid of any division. In Ephesians, the apex of Scripture written to and about the Church (ekklesia), the Body of Christ, God parallels our being “members of Christ’s body” to the oneness that is possible in marriage (5:28–32). When God first told the risen Lord Jesus this earthshaking “Secret” that He had theretofore hidden in Himself, Jesus surely thought it was very cool, because in one of his last prayers he had asked God that his followers “…may be one as we are one” (John 17:22). When the Lord later gave Paul the revelation of Ephesians, he called this body of believers the “one new man” (2:15). In English, the root uni means “oneness.” Hence we have words like “unity,” “unit,” “unite,” “union,” “unified,” “unitarian,” and “communication.” God designed the Body of Christ to accomplish, at least in part, His goal that “…all men to be saved and to come to a knowledge of the truth” (1 Tim. 2:4). It goes without saying that to accomplish any project, a unit of people must communicate and be unified. How do you think the worldwide Christian Church is doing in that regard? If you said, “Pitifully,” I must agree. This is the first of only two uses of the word “unity” in the Church Epistles. Note that it does not say, “attain” the unity of the spirit. That is because Jesus Christ attained it for us all by his life, death, resurrection, ascension, and his giving of the holy spirit to each believer since Pentecost who has made him Lord. 1 Corinthians 12:13 (KJV) states that “…by one Spirit are we all baptized into one body….” Now it is up to us to function as a body is designed to do—efficiently. Maybe if we keep reading in Ephesians 4 we will find the basic key to doing what verse three exhorts us to do. 4 There is one body and one Spirit—just as you were called to one hope when you were called— 5one Lord, one faith, one baptism; 6one God and Father of all, who is over all and through all and in all. 7 But to each one of us grace has been given as Christ apportioned it. The above verses are one of the most significant sections in the greatest revelation ever given to the Church, but too often they are overlooked. Have you ever wondered why they follow the exhortation in verse 3? Have you ever noticed those seven “ones”? Do not the nouns they modify capsulize all the basic doctrinal truths found in the Church Epistles? Absolutely. Stay your mind on each one of them for a moment and think what the Epistles say about what is the Church (the Secret), what is the gift of holy spirit (and the manifestations), what is our hope (not death or Tribulation), who is the Lord Jesus Christ (and who he is not), what doctrinal truth in which we put our faith, what is the “baptism of holy spirit” (and permanent salvation), and who is our God and Father. How many Christians fully understand even one of these seven vital truths? Not many. Why? Because very few church leaders know them and teach them. And that is why there is so much division and confusion among Christians. The only basis for genuine unity, the kind of unification by way of which we can accomplish God’s purposes, is a oneness of mind about the doctrinal pillars of the Christian faith. We clearly see that at the onset of the Church in Acts 2:42 (KJV): “…they continued stedfastly in the apostles’ doctrine and fellowship [koinonia]….” Those words are in the order they are because true fellowship requires doctrinal understanding on the part of each believer. And what was the result? WOW! They turned the world upside down. That is because truth—and only truth—sets people free. OK, so all you need to find is a bunch of believers who are teaching and practicing the above truths, a body of Christians in which the five “equipping ministries” of apostle, prophet, evangelist, pastor, and teacher are functioning. Uh-oh. Don’t know of any near you? That’s too bad, but all is not lost. It can start with you. And to help you…drum roll and cavalry (actually Calvary) bugle call…(go ahead and vocally simulate it, just for effect)…here comes our flagship foundational class, One Day With The Creator!!! 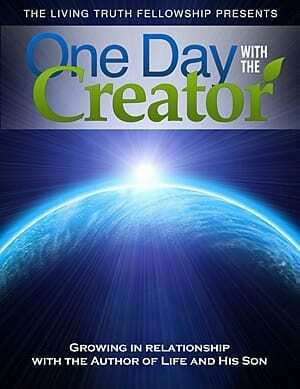 One Day With The Creator is a thrilling journey into the heart of God. As such, it highlights and exalts The Star of God’s show, the risen Lord Jesus Christ. The purpose of the class is to lead people to him. Some will find salvation. Others will come to know the written Word and the Living Word like never before. For some it will be the spark that ignites their individual ministry in the Body. Others will find it to be the catalyst that helps them build a fellowship. One Day With The Creator will help you choose your own adventure. What are people saying about One Day With The Creator? The few who have thus far seen some of it think it is: “Stunning, spine-tingling, exhilarating, hilarious, poignant, trenchant, enlightening, gripping, precise, superb, uplifting, thrilling, and a first class production in every way.” Once you see it, I think you will be very motivated to share this systematic curriculum of learning with everyone you possibly can. We will do all we can to help you use this unique tool to both build the Word in individuals and build a local fellowship of brethren who are united upon Truth. Why settle for anything less? One of our TLTF Trustees recently wore his classy ODWTC T-shirt (got one?) to the doctor’s office. When the doc saw it, she asked if it’s a class, because that’s what she’s been looking for. God knows every human being who is hungering for Truth, and those people will embrace a course of study that will teach them that Truth. We know that He and the Lord will do their best to bring those people to us, but we must do our part to boldly proclaim His Truth amidst the din of decadence, deceitfulness, and despair. ATTENTION, YUTES! If you are age 13–31, the Lord Jesus was once your age, and he needs you to turn your world upside down for him. We tried to make ODWTC appealing to young people, and we are eager to see how successful we were in doing so. If you know any young people, please present the class to them enthusiastically. I know lots of former teens who once reached scores of their high school and college peers. ATTENTION, FORMER YUTES! Do you know anyone who attends a college in your city? If so, please present the class to them and see if you can run it on campus. At some schools, you need only a student representative to become an official campus organization and get free meeting rooms. GOT KIDS? God makes it clear that if you are a parent with underage children, they do not have a choice as to whether or not they hear the truth of His Word. That’s because you choose to obey God and teach it to them. Their choice is whether or not they believe what they hear. How wonderful for a family to go through One Day With The Creator together. Please PRAY for doors of utterance, pockets of proliferating people, family members who will turn on others. Let us pray that the Word explodes in the hearts of many who hear it via this class. And let us also pray for many brethren to rise up to serve those who come to the Truth and help them grow in their individual ministries. We need godly leaders. In next month’s FRUIT OF D’VINE, we hope to give you a suggested schedule for running the class for a group of people. Experience shows that it is imperative to do so in as short a period of time as possible so that the participants get the most out of it. Do you remember what a joy and blessing it is to see people turn on to the Word of God? As we do our best to keep the unity of the spirit in the bond of peace day by day in this fallen world, we look to our glorious hope, the day when we will see our Lord face to face. One description of that great day contains the only other use of the word “unity” in the Epistles: “until we all reach unity in the faith and in the knowledge of the Son of God and become mature, attaining to the whole measure of the fullness of Christ” (Eph. 4:13). Finally! Aren’t you glad you’ll be there? Let’s help others get there too.